In 1947, when panditji was waiting in the tuticorin railway station along with many of his clients who had gathered there to bid him farewell, one of the them walked up to him with a man. Introducing the young man as M.Yusuf, a loyal and hardworking employee who had lost his father at a very young age, he requested panditji to bless him. Upon hearing his name, panditji felt a sudden urge to change his name and did so after talking to him about his background and life for a while. He advised him to write his new name, A.E.M.Yuseff 32 times a day, every day without fail. To the shock of the client who had introduced the young man, also told him to quit his current job and go to Ceylon to start a new life there within 90 Days. Time flew and in the year 1951, Panditji visited Ceylon as special guest of MR. Vairamuthu, then Secretary to the Home Ministry. He used to go for walks on a daily basis taking a particular route by 7 p.m. One day, he decided to take a different route for a change. While walking through this new locality, he saw a big house with a beautiful garden and was surprised to see that the name of the owner of the house as inscribed next to the gate was A.E.M.Yuseff. Panditji, thinking about the name with the unusual spelling he had given to the worker in Tuiticorin, wondered if this could be the same person. He noted down the address of the house and got the owner’s phone number after reaching the place of his stay. 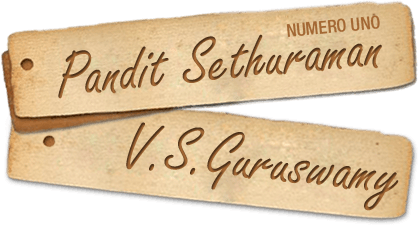 When the person attending his call introduced himself as A.E.M.Yuseff, Panditji simply asked him if he was from Tuticorin and if his name number came up to Number 41. Startled, Yuseff asked if the person he was talking to right now was Sethuramanji from India. When panditji confirmed this, he took down panditji’s address that was only a 15 minutes’ walk away from his place overjoyed and told panditji that he will visit him the next morning by 10 A.M. Thinking that Mr. Yuseff must have had some appointment, Panditji went to bed.The next morning at 10 A.M, MR. A.E.M. Yuseff arrived with four cars bringing with him a wide variety of fruits, flowers, sweets and money. He said, “Panditji, please excuse me for not coming to see you last night itself. I was amazed to receive your call and I felt happy beyond my imagination. During my last meeting with you in India, I was a mere worker and you did not even ask me for any money when you changed my name. Today I am a Multi-Millionaire. I did not want to see you empty handed and as most shops here close by 8.p.m. I had to wait till the morning to buy everything I wanted to offer at your feet. I stayed up all night worrying about you possibly misunderstanding my intentions and could not even sleep for five minutes” with tears in his eyes. Panditji was moved by his dedication and love. Yuseff had moved to Ceylon 40 days after panditji had told him to do so. Managing to get a job in a clearing and forwarding company, he had started his own business in a year and it had flourished beyond his expectations. He pointed out at a new car in the entrance and requested panditji to use that car during his stay in Ceylon. He had also left a driver with the car at panditji’s service. Seeing his sincerity, Panditji complied. When pandiji decided to depart from Ceylon, Yuseff insisted on sending the car with him to India. Amused, Panditji informed him of the exorbitant import duty India had at that time. Mr Yuseff replied saying “I don’t mind paying that and delivering the car at your doorstep”. Moved, Panditji refused his offer in a gentle manner saying you can use this car as my remembrance. The memory of this incident remained evergreen in his heart throughout his life.